During this Extraordinary Jubilee of Mercy, which began on December 8th of 2015, Pope Francis has invited us to grow in our understanding and experience of mercy. Mercy can be described as love which continues to love in the face of rejection. It is unmerited, unwarranted love. God, Who is Love itself, is the perfect combination of both justice and mercy. All of Scripture recounts His merciful plan of salvation--what He did in spite of rejection to love His people and call them back to Himself for all eternity. The most beautiful account in Scripture of the mercy of God is recounted in the parable of the prodigal son. The father in the narrative represents God. His son, who has taken his inheritance prematurely (effectively signifying that his father was dead to him), squanders it. Left in destitution and despair, he decided to come back to his father's house, preferring the life of a servant to his current condition. The father has been waiting anxiously for the son's return, looking on the horizon day after day with hope and longing for their reunion. He runs out to his son, embraces him and celebrates his return. This is God himself who longs to be reunited with us. "At times we are called to gaze even more attentively on mercy so that we may become a more effective sign of the Father’s action in our lives," Pope Francis wrote. During this Year of Mercy, let us encounter the mercy of God more deeply in order to live as witnesses of mercy, love and joy. 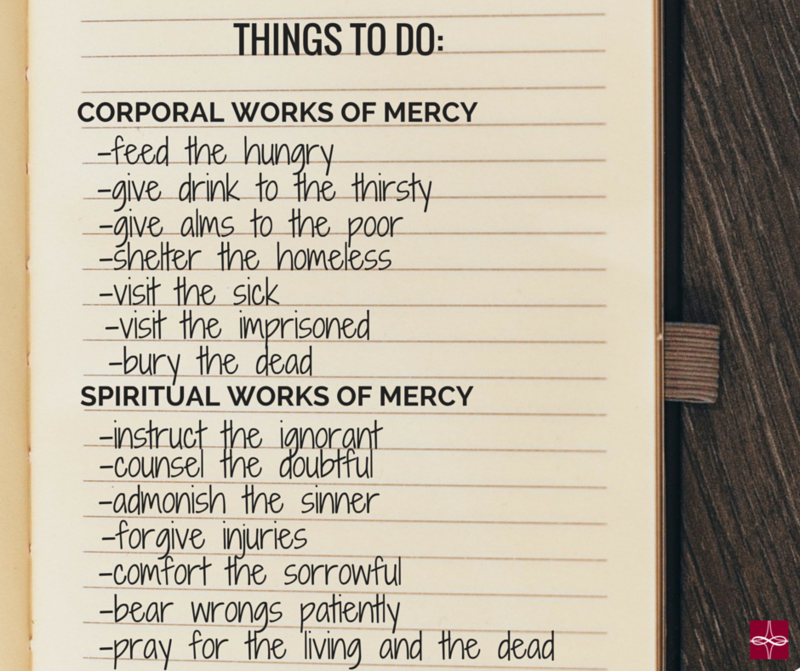 The corporal and spiritual works of mercy, listed below, will help us as we strive to continue to grow in our understanding of being "merciful like the Father." ​Water is the very essence of life. To give drink to the thirsty is to offer them life itself. 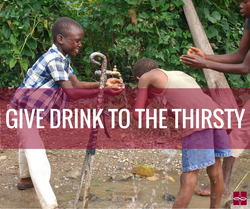 Giving drink to the thirsty can be lived out by volunteering at a soup kitchen, contributing funds to clean water and well projects in underdeveloped countries or even within a family, as a mother provides food and drink to her children. Also be mindful of your own water consumption and try not to waste water. 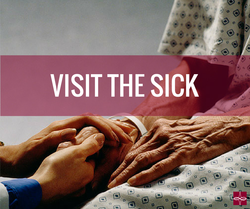 Visiting the sick can mean going to the hospital and praying with patients there, bringing a sick family member or friend flowers or something to eat, visiting a nursing home, or offering someone going through an illness support. Our health is a gift and blessing. 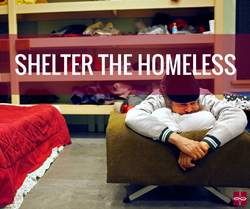 Let us make a special effort to reach out to those in need this year. 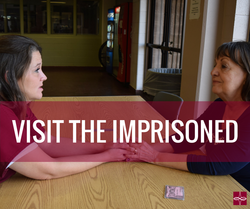 Visiting the imprisoned can be difficult to participate in without special clearance or permission. If you find yourself unable to physically visit the imprisoned, try getting involved in a ministry that writes letters to the imprisoned or one that organizes retreats for them. Those incarcerated, and their families, can always use prayers. During funerals, we mourn the loss of life. As Christians, we live in the hope of the Resurrection. 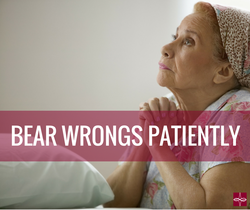 Participate in this work of mercy by offering condolences or sending a card to someone whose lost a loved one. Pray for those who have gone before you whenever you pass a cemetery or go to a cemetery intentionally to pray. Counseling the doubtful means helping guide someone towards truth. As Christians, our very lives should be a witness to the truth that God sent his only Son to redeem us and invite us to share in his life forever. Each of us, however, can go through moments of doubt. 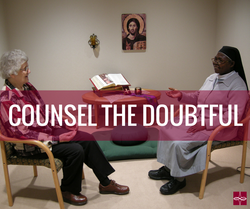 How can we counsel the doubtful? Some examples could include: a priest guiding a person towards a life of virtue in confession; a mother or father instructing or correcting their children; a spiritual director helping someone grow in their spiritual life; a teacher helping their students learn a certain subject. Our Catholic faith is incredibly deep and rich. Knowing all of it can be impossible, but it's important to learn as much about it as we can! Instructing the ignorant means teaching others how to live according to the Gospel and how to be followers of Christ. 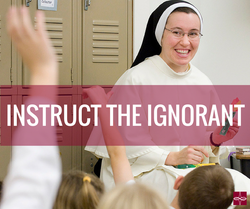 This can include formal Catechesis, helping in an RCIA program, volunteering in youth ministry, teaching Religion classes or religious education, or even teaching your children or family members about different prayers, devotions or Church teaching. Admonishing the sinner means helping someone who has fallen off track get back on the path towards holiness. We all fall at different points of our life. Sometimes, we need help choosing the good and sticking with it. James 5:19 says, "whoever brings back a sinner from the error of his way...will cover a multitude of sins." 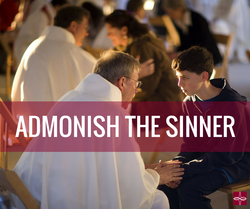 Admonishing the sinner can include a priest helping guide someone in confession, a spiritual director pointing out some negative patterns or tendencies in a person's life, a friend or roommate sitting down in love to point out some wrong behavior or actions to a loved one. Admonishing the sinner should never be easy. We do not do it out of spite or pride, but as a merciful act of love to bring someone closer to the heart of the Father. We all experience different moments of sorrow in our lives. 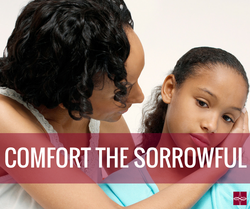 Comforting the sorrowful involves reaching out to those having a hard time and accompanying them on their journey of grief. Call a friend whose been feeling down and ask them about their day. Send a card to someone going through a difficult time. Listen to and comfort a friend who needs to vent or cry. Don't forget the value in simple accompaniment. 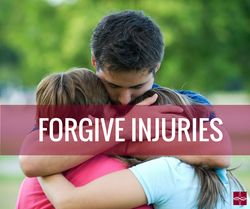 Forgiveness often is not our natural response when we have been hurt or wounded. It's much easier to close up, hold a grudge or avoid the problem altogether. As Christians, we know that only forgiveness will lead us to true freedom. Try to understand why someone might have hurt you. Does it stem from their own woundedness? Pray for those that have harmed you. Pray the Chaplet of Divine Mercy and ask to grow in the mercy. Because we live in a fallen world, we face injustice throughout our lives. Do not fear to ask for the strength to encounter hardship and sorrow with patience when it arises. There will be moments when you feel unjustly treated by co-workers, family, friends, or even by God himself. Ask for clarity, patience and joy in the midst of these trials. Pray for those who have treated you unfairly. This may also be a good time to pray about any time you have treated others unfairly. ​Prayer unites us not only with God, but with each other. 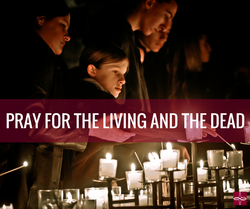 We are called to pray, as the Church, for the other members of the Body of Christ. Some of these members have gone before us. We pray for the repose of their souls, especially within our families, so that we may hope to join them one day in heaven. We also pray for the needs of our friends, family and those of the whole world. Ask a friend or family member how you can best pray for them. 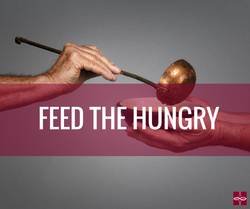 Write down a list of prayer intentions and bring them with you to Mass or the chapel. 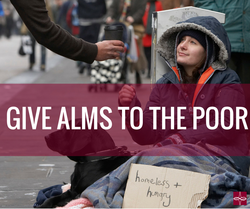 Offer up your day, work or activities for the needs of those around you. 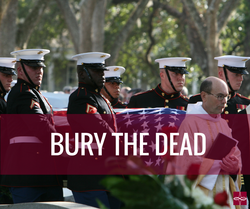 Offer up a Mass for a deceased loved one or family member.